Usually one of the trash boxes in a typical Berlin backyard is reserved for paper and cardboard recycling. And usually it is either a blue bin or a blue lidded bin – but sometimes it’s also just plain black and the only indicators are the sticker saying “Altpapier / Kartonagen” as you can see in the picture above. And often yu can recognize it rather easily by the bin’s actual content: paper and cardboard boxes. Often the reccling bin for paper and cardboard it quite overstuffed. Since people are ordering more and more things over the internet, more and more packets and parcels are delivered – and more and more of those boxes are thrown into the blue lidded bin. Especially around christmas the paper and cardboard recycling box can be overstuffed. A well intended advice: please try to reduce the volume of cardboard boxes by taking them apart before you put them into the bin. It is possible. Thank you! 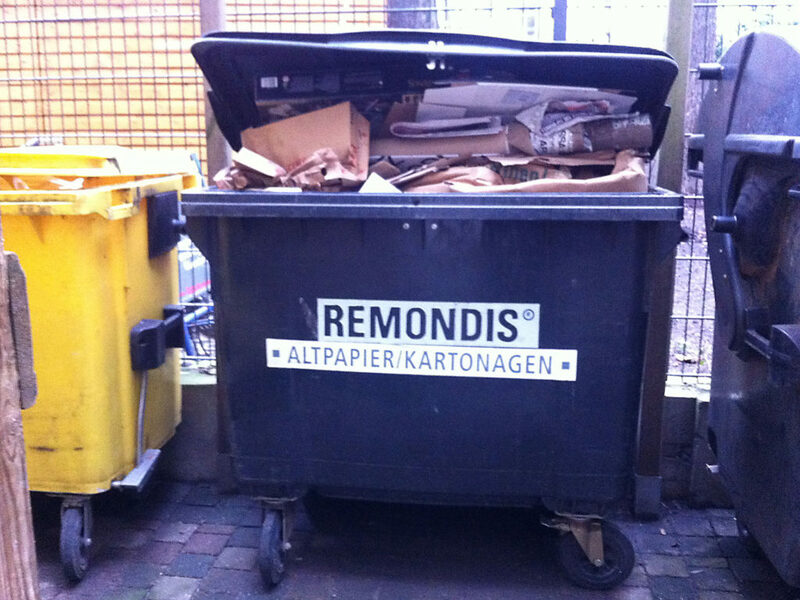 » Back to the main page about trash and recycling in Berlin. Where should I throw away my paper/cardboard? Is there a way to find out where public ones are? Well – that’s a bit a tricky question, because for quite a while there are no more public paper bins in Berlin.So I suppose as for now you’ll have to throw the paper into the regular trash bin – which is a shame. But you might want to talk to your landlord about this matter: a paper bin is rather cheap in comparisson to a regular trash bin. So the landlord could actually save money by ordering a paper bin – and maybe reducing the size of the regular trash bin. Might be worth a try… Good luck!